Night Garden Collection - COLORFUL - Night Blooming Flowers, 4 Packs! 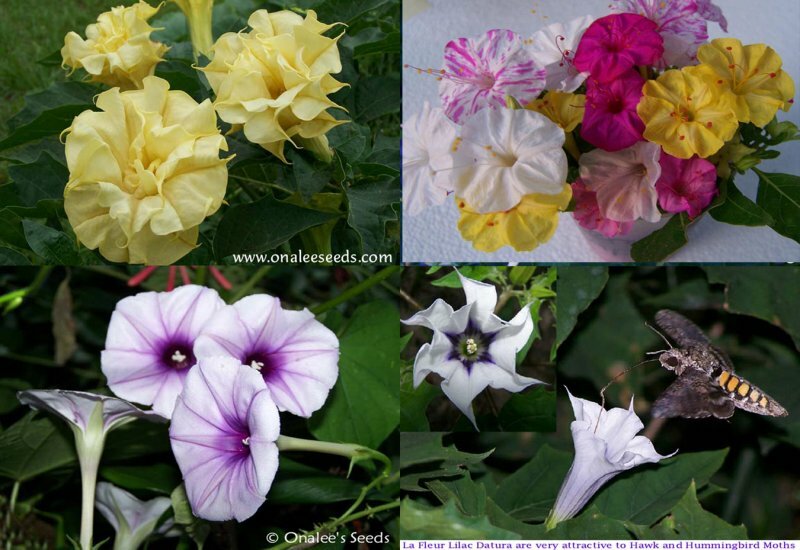 Four varieties of seeds for lovely, colorful night blooming flowers including four o'clocks, devil's trumpets, and lavender moonvine. 4 packs for the price of 3! You'll receive four varieties of seeds for lovely night blooming flowers for the price of three. Perfect for your night garden to attract hummingbird and hawk moths and add wonderful fragrance to the evening breeze! You'll get one individual (not mixed!) pack of seeds for each of the following flowers. Full planting instructions will be included for each variety. These are perennial tubers with fragrant 2 trumpet shaped blooms that come out in late afternoon and stay open until early morning. They can be grown in full sun or partial shade, and can get to 3" - 4" tall by their second or third year. Because they are tubers, they tolerate infertile soil, drought, and neglect. Hardy to USDA zone 7b (+5 degrees F). Treat as a self-sowing annual in colder zones or lift root and store like a tender bulb for replanting in the spring. 10+ Lavender Moonvine (Ipomoea Turbinata) seeds. This close relative of the morning glory has similar heart shaped leaves that are a rich green with an interesting stem that is covered in 'faux" thorns (they are soft - won't stick you!). They provide a beautiful backdrop for the lovely, 2, lavender/pink moonflowers. Prolific Bloomer!! These fast growing Datura (Devil's Trumpet) have fragrant, triple (sometimes double), creamy-yellow trumpet shaped blooms about 8 inches long that face upward and attract hummingbirds and sphynix moths as well as butterflies. Datura is a perennial in zones 8 and up, grow as an annual in colder zones. A delightful and easy to grow plant, suitable for a container or the garden! These fast growing Datura have single, white trumpet shaped blooms with lilac/purple highlights in the center. Blooms are about 3-4 inches long and face upwards, attracting hummingbirds and sphynix moths as well as butterflies. They open in the evening or on cloudy days. The blooms are replaced with interesting, thorny-looking seed pods that reach 1 in diameter and, when ready, pop open to re-seed themselves in your garden. The tightly scrolled flowers are short lived but are produced in a regular and abundant procession. Note: For purposes of qualifying for the free bonus pack, this counts as ONE PRODUCT. Night Garden Collection #1: Fragrant White Flowers - 4 packs for the price of 3!